Christmas time is coming and as usual December in Florence and in its surroundings means you can find many special events and markets related to Christmas. In Florence in Piazza Santa Croce from December 2nd to the 20th you’ll find the German Christmas Market with its characteristic wooden cabins. Opening hours from 10 am to 10 pm. Christmas Trade Fair at Stazione Leopolda in Florence from the 5th to the 13th of December. It opens from Friday to Tuesday from 10 am to 10 pm and on Wednesday and Thursday from 3 pm to 10 pm. Ticket costs € 7,50; reduced ticket is € 6,00; children under 3 years have free admission. At Florence’s Saschall theater from the 11th to the 13th of December. A charity Christmas fair organized by the Italian Red Cross where profits will be distributed to Florentine needy families. It opens on Friday from 9.00 am to 3.30 pm, Saturday and Sunday from 10.30 am to 7.30 pm. Tickets cost € 5,00; free admission for children under 14 years. 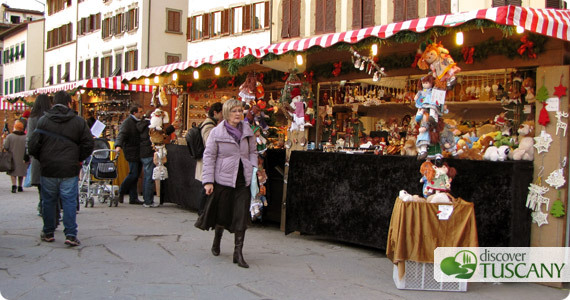 Throughout the streets of Marradi in Mugello every Sunday in December (6, 13 and 20) you’ll find the traditional Christmas market with many stands. There will be live concerts and various performers to provide entertainment for both adults and children. You can reach Marradi by taking the characteristic steam engine train that departs from Florence’s SMN train station (read our post and see our steam engine train video we made when going to the traditional Marradi chestnut festival in October!). In Palazzuolo sul Senio, in the Upper Mugello, on the 6th, 8th, 13th and 20th of December from 10 am you’ll find another local Christmas market with many stands, shows and performances. Check out the program (in Italian) to better plan your visit. From the 8th of December to the 6th of January 2010 you can also admire “1000 nativities for Palazzuolo“, a special tour throughout the city to discover all nativity scenes made by local shopkeepers, residents and associations in Palazzuolo. In Piazza Matteotti in Greve in the Chianti region, from the 13th to the 20th of December you’ll find a special crafts market along with various musicals and other entertainment perfect for the entire family. From the 22nd to the 24th of December in the historical center of Certaldo you’ll find a Christmas market where you can buy local specialties as well as Christmas treats, decorations and any last minute special gifts. In Florence on Sunday, December 6 head over to Piazza della Repubblica and to Piazza Duomo, which was recently closed to traffic, to see the lights be turned-on on the two large Christmas trees set up to brighten the holidays for shoppers downtown!